The Adventures of Pippi Longstocking was a favorite children's book written by Swedish author Astrid Lindgren. An eccentric pre-teen with a wild imagination, Pippi created her own, iconic style. Create a quirky Pippi Longstocking costume for an easy and unusual costume that is easily recognizable. A clever last minute costume doesn't have to be labor-intensive or expensive to create. 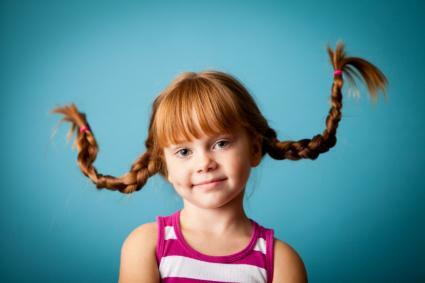 In fact, although a Pippi Longstocking costume may be purchased at select or specialty costume shops, this unique costume idea can be whipped up at home with a few select pieces of clothing found in your closet. Are you ready to morph into a mischievous and playful pre-teen? It's simple; just follow these instructions. Part hair down the center into two equal sections. Tie off one section with a hair elastic to keep it out of the way. Now you're ready to work on the other section. Work hair gel through the hair to help give it hold and divide it into three sections. Place a pipe cleaner in the center of each section of hair and begin to braid. The pipe cleaners will allow the hair to bend upward when you're done braiding to get Pippi's signature hair style. Remove the elastic from the other section and repeat the process with that hair. Bend the hair upward in the center of each braid to form a U on either side of the face. Spray the hair with hair spray to hold, or red hair spray to get the correct color. Tie ribbons or bows onto the ends of each braid. It's well known that costumes always look their best when they are exaggerated with cosmetics and special effects. To create a whimsical Pippi face, apply blusher heavily in round circles directly on the apple of the cheeks to add a spunky and playful glow. To create faux freckles, use an eyebrow pencil or eyeliner to draw on dots. False eyelashes will add an exaggerated appeal to your costume. Don't be afraid to layer tops or turtlenecks for an eccentric sense of style. Pippi dressed in a very haphazard manner, so don't try too hard to capture perfection. Instead, use your creativity and find a few playful or printed pieces that can be thrown together casually. Stockings or striped tights are a must for a quirky Pippi Longstocking costume. During the Halloween season, striped witch costume tights can be found easily. When shopping off season, consider a calico printed knee high sock that can be pulled down to the ankle on one leg, and kept at the knee on the other. Because Pippi had a messy aura about her, it's not important for her wardrobe pieces to be in perfect condition. Shopping at thrift stores or resale shops is a great idea for those trying to create a Pippi look on a budget. Accessories can make or break an outfit. For a few prop ideas for a Pippi costume, consider adventurous items such as a pirate hat or vintage apron. Pippi was quite imaginative, so use this aspect of her personality to pull together your own props. Perhaps Pippi was going out to sea to find her father? A compass and a pair of binoculars may fit the bill. If Pippi was seeking a buried treasure, a treasure map and a flashlight may make the perfect props. Although Pippi Longstocking makes the perfect budget conscience idea for a costume, her unique look and free spirit make her an equally fun and creative character to emulate. Embrace your quirky side the next time you're in need of a costume idea and bring this classic character to life.